In a prior post we discussed the features and benefits of the Leaf Master. If your pool has many leaves and you are not using this tool, you are wasting time. Although awesome for cleaning leaves, the procedure for use of the Leaf Master can be a bit trouble some fighti ng with a garden hose. Our technicians have a solution in many application. The use of the swivel adaptor (picture seen here) can be attached directly to your pressure side automatic pool cleaner line. This application can only be used with small hose pressure pool cleaners such as the Polaris 380, Pentair Legend, and Jandy Ray-Vac to name a few. 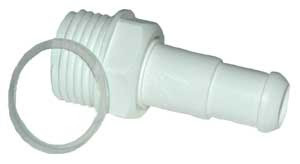 The procedure is as simple as disconnecting the head of the pool cleaner from the hose and then attaching the Leaf Master. Now you have the pressure of the pump running the Leaf Master which is usually more effective than the garden hose pressure as well.